If you want to travel to beautiful resorts for free, become a financial adviser. Later this month, three dozen advisers will spend three days at the Ritz-Carlton Hotel in Marina del Rey, Calif., all expenses paid. Next month, about 75 wealth managers will spend four days and three nights in Mexico City, staying at the Four Seasons Hotel and dining at lavish restaurants like Cipriani and Nobu. The advisers won’t have to pay for their airfare, hotel, meals or entertainment. At such “due-diligence conferences,” advisers meet with fund companies and other businesses. The events, say sponsors and financial advisers, are an efficient way for advisers to glean valuable insights from dozens of experts under one roof. But an adviser’s job is deciding where to put your money. Wining and dining with money managers for free under tropical skies could cloud his or her judgment. The format can vary, but advisers often sign up to meet face-to-face with asset managers for 20 to 25 minutes at a time. An announcer declares when time is up, and the advisers then switch to meet with the next managers on their list. These regimented sit-downs are nicknamed “speed-dating.” Over two to three days, advisers tend to have at least 16 speed-dates with managers. Some events also feature “dine-arounds,” with advisers and fund managers meeting at gourmet restaurants. Financial advisers generally aren’t invited to participate unless they control at least $50 million in clients’ assets, often much more. Typically, one to three dozen advisers, and about the same number of fund managers, attend. The organizers of these conferences pay for all the advisers’ costs with sponsorship fees from the fund companies and other financial firms. In addition, many fund managers directly host advisers, all expenses paid, at their headquarters or at tourist destinations. 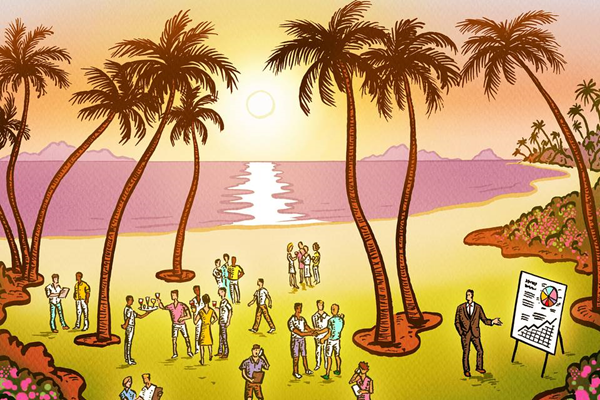 Could a free trip to a posh resort make an adviser more inclined to favor the hosting funds, even if they aren’t the best match for every client? So, he says, advisers should disclose their attendance at such meetings to their clients. Andrew Hall, a vice president at Narwhal Capital Management in Marietta, Ga., says he last attended a Wealth Investment Exchange event in 2014 but didn’t invest with any of the managers. He says Narwhal didn’t disclose his attendance, but would have if the firm had used any of the sponsoring funds — or “even if it had merely appeared” to be influenced by the event. “If you’re an adviser, you’d still be going out to dinner with these people anyway” even if you didn’t attend such a conference, says Mr. Manko of Wealth Investment Exchange. Still, these meetings are a reminder that in the financial industry, the potential for conflicts is as pervasive as oxygen. A spokesman for the American Medical Association says it “would not be acceptable” for a physician to accept an educational trip paid for by a drug manufacturer. According to the code of ethics of PhRMA, the trade association for pharmaceutical companies, its members should not provide entertainment or leisure, such as vacation trips, to doctors and other medical professionals. The financial industry should adhere to the same standard. Write to Jason Zweig at intelligentinvestor@wsj.com.